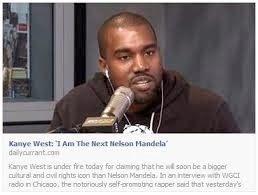 “I am the next Nelson Mandela. I’m only 36 years old, and when I look at everything I’ve accomplished, it’s the only comparison that makes any sense. By the time I’m 95, I’m going to be a bigger hero than he ever was. Nelson Mandela did a lot of good work, don’t get me wrong. But I think I’m on track to do something even bigger. I liberate minds with my music. That’s more important than liberating a few people from apartheid or whatever. “I’ve blazed a trail with my career. I faced mad racism when I entered this profession. I mean how many black rappers can you name that came before me? I was a pioneer. And now I’m doing the same thing in the fashion world. Not to mention I have a bigger market than he ever did. Mandela was working in South Africa, which has, like what, six people? I started my magic here in the USA and then I took my business global. Worldwide baby. Whoa! I have no comments. No comments, mehn!